If you need to bug out or pack light, then you’ll want to embrace any gear that can serve multiple uses. Ponchos are great for rain gear, but did you know they can also act as a shelter or tent? I am a big fan of multi-purpose gear. That’s why I have a Military Poncho in my Get Home Bag (GHB) and have one in each of my vehicles. If I’m somewhere and it starts raining, I whip out the Poncho and, BAM, there’s my rain coat. If things go real bad, and I’m walking home, the poncho can act as a shelter or tent. Before we get to far into this post, I should mention that you don’t have to use a Military Poncho, a decent tarp can act as a tent, but keep in mind, that a tarp might look really strange for every day rain gear. I know, I know. All you readers, that have a family, are thinking that you may not need a Military Poncho or a camouflage tarp because you already have a tent. If you are bugging out, or are on the run with your family in tow, chances are you have a tent. I don’t know what’s happened in the tent industry, but every tent I see these days, is a bright orange or yellow color. You might want to use a sizable camouflage tarp to cover that brightly colored tent. I’d also point out that someone has to stay awake on guard duty, while your family is fast asleep. If it’s raining you may want wrap up in your poncho or tarp to stay dry, or to erect a shelter, where you have a view of the approach to your camp site. Yes, I did use my children’s jungle gym, since we have no mature trees in our back yard. This does prove that you can practice your outdoor skills without leaving your yard! using twigs for tent stakes at the corners. I typically like to tie my paracord to an anchor point like a tree (ok ok..or a jungle gym), then push a loop of cord through one of the grommets and insert a twig in to the loop, then repeat on the other side of the poncho. This way I don’t have to cut my paracord or tie fancy knots to the grommets. I can also adjust the tension or tightness of the poncho. Check out the pictures for more info. Normally I would tie the hood area shut to prevent precipitation entering my cozy shelter, but it was really hot, so in that case I leave it open to vent heat, like a gable vent. This is a variation of the pup tent style of Poncho Shelter 1. I use sticks (I had dowel rods handy today, that’s not typical in the forest) to hold up the front of the shelter for visibility and airflow or to keep an eye on a campfire. This would also allow heat from a camp fire to heat the inside area. I know these shelters aren’t pretty, but I was only using twigs and a Swiss Army Knife to build it. Imagine how great this shelter would have been if I had tent stakes and a mallet (or shovel) to drive those stakes into the ground. I’ll be showing some other Military Poncho shelter variations in upcoming posts. I wanted to show you how Ponchos (or tarps) and a bit of paracord can make very decent Poncho Shelters. Using multi-purpose gear can save important space in your pack, that you can use for other essentials! 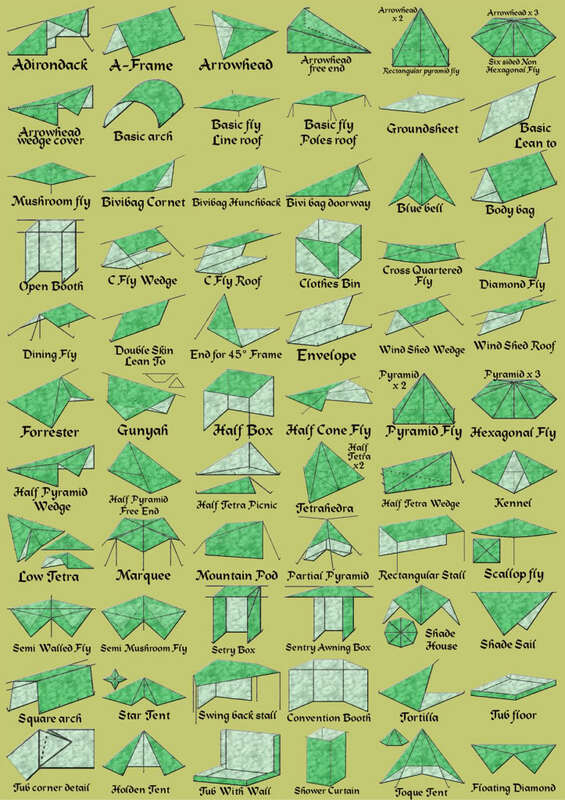 Also see our Tent Survival and Shelter Mastery post with buyers guide. If you liked this post, come like us on Facebook (Geek Prepper), or subscribe to our newsletter, to see our new posts. Only a few of these are practical, the rest are a waste of time. 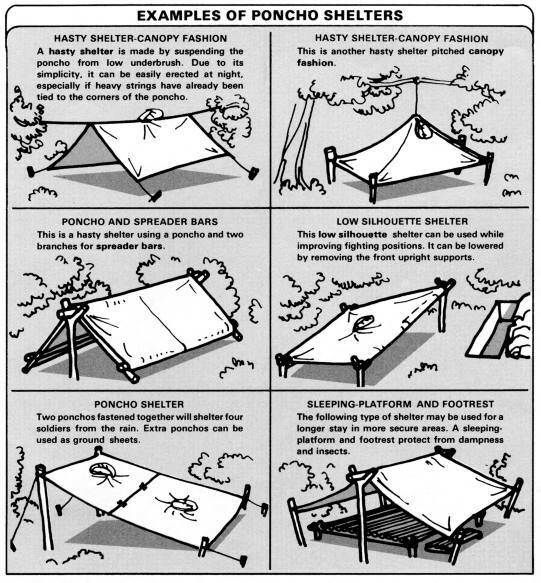 In a SHTF situation you do not have time to waste setting up fancy shelters until you get to your BO site. Then you want something a little more permanent than a tarp shelter. Es muy buena idea, adenas muy util tambien puede constrir una hamaca con el poncho. One of the best uses for tarps that we use is to cover the fire pit area. Once you have the area figured out where your gong to build your fire, stretch the tarp between 4 trees as high as you can reach over the area. Angle the trap slightly down hill away from the fire so that any unexpected rain flows away from your fire. This will keep you and your fire dry if a rain storm should pop up, this also gives you a dry place to store fire wood in a rain storm. The wind break idea comes in very handy during winter camping as well! Really shows the flexibility of a tarp, if you use your noodle.